The premier attorneys at In Law We Trust, P.A, aggressively represent husbands and fathers in divorce and family law matters. Our specialty is working with men who are concerned about contested or uncontested divorce, child support, child custody, alimony, equitable distribution, preserving their assets, and any number of the many unique challenges that men face in Florida’s court system. In today’s world, men continue to become more interested in remaining active fathers when their marriage or non-marital relationship ends. Unfortunately, Florida courts and the state’s family law statutes have not completely kept pace with this changing mindset. Knowing that we exclusively represent men gives our clients the confidence they need to know that their rights are being recognized, respected, and fought for. The family lawyers for men in Tampa, FL, of In Law We Trust, P.A. are proven, effective representatives and advocates for husbands and fathers. We handle a wide range of family law matters, always keeping our client’s goals and best interest at the forefront. By working with in Law We Trust, P.A., you may be able to work out the best parenting and custody plan, preserve your assets, and avoid costly financial mistakes that could burden you well into the future. In Law We Trust, P.A. has the reputation for making sure that if child support or child custody is your goal and that is what is also in the best interest of the children, we will present the best case for you to achieve that outcome. Whether you are seeking spousal support yourself, or you are opposing what you believe to be unfair monetary support to your spouse or children, in Law We Trust, P.A., will address these issues and be sure that the courts give you fair treatment. We fully understand that an order of protection may be necessary for the protection of the victim, and that sometimes charges of domestic violence may be an attempt to “punish the spouse.” If you have charges brought against you, or feel that you are the party that needs to be protected, call us right away. In Law We Trust, P.A. is ready to listen your side of the story and give you the appropriate advice. In Law We Trust, P.A. represents high profile professionals who have a high net worth, multiple assets or complicated business and financial backgrounds. We will work hard to protect your financial interests in divorce, such as setting reasonable and fair child support and/or alimony support. We know you worked hard to obtain your financial status and it is always our intent to deliver the highest level of client service for a fair cost. If mediation and negotiation has failed for you, In Law We Trust, P.A. is ready to review your case and take it to trial. We know how important a fair and timely resolution is to you, and we are well equipped to be the Tampa family law attorney for me that sees to it your rights are protected. Lastly, remember that family law issues and divorce can be a highly charged, emotion time for all concerned. 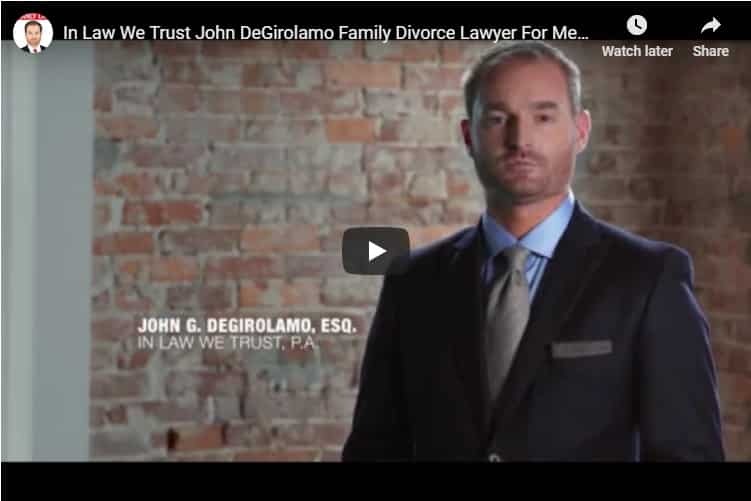 Take a moment to see the Common Mistakes Men Make in Family Law and seek counsel of In Law We Trust, P.A., Tampa family law attorneys for men. Remember, as your attorney, we cannot disclose what you tell us – even if you confess to a crime. Attorney-client privilege is designed to ensure that you are candid with your lawyer. Under most circumstances, as your lawyer, we cannot tell anyone – a judge, the police, a jury, or your family members – what you tell us in confidence.